With the popularization of scientific analysis on television shows like CSI and Law and Order, it seems science can tell us everything these days. It can solve every crime and decipher every riddle. Partial fingerprints? No problem, they’ll catch the baddie with reconstructed prints. Only paint chips left behind at the crime scene? No worries, they’ll scan it will specialized gizmos and compare it to giant databases of obscure information to tell you the make and model of the car they came from. Easy, right? And if such techniques like these exist to investigate situations in the modern world, it’s only one step further to apply them to the ancient world. Surely with such fabulous investigative techniques there are no remaining mysteries at archaeological sites. Every wood chip is datable, every stone placement tells a story, every piece of DNA is assignable. The all powerful science has revealed all. Or has it? The problem is, that these techniques are often misrepresented on television and in other media sources. They exist, and yes, they are extremely helpful; but often the public gets the wrong idea about how successful and how easy modern scientific analytical techniques actually are. Especially when they are applied to archaeology. Let’s take dendrochronology as an example. Dendrochronology is the study and dating of tree rings. As trees grow, they annually produce rings within their wood. 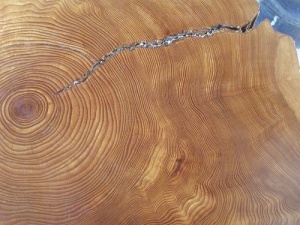 These rings are physical manifestations of the tree’s growth from the beginning of the year when the tree develops a wide thin-walled cellular structure and the end of the year as the tree’s cell structure changes in the fall and winter, creating light and dark fluctuations: ‘rings’ ~which extend outward from the tree’s heart. The more rings a tree has, the older it is. Changes in sunlight and water availability can further increase or decrease the width of a tree’s rings, providing valuable indicators for solar variations in the earth’s movement around the sun and other environmental indicators such as drought. When a tree ceases to grow: its rings stop. By creating databases of rings with known dates, new samples can be compared to sets of previously collected samples in order to find the time period in which the rings from the new sample and the database match each other. Dendrochronology is used in a variety of modern studies, ranging from environmental studies on the decline of species of wood in certain areas, like the deforestation of the area around the ancient Mayan city of Tikal. To the establishing of construction dates for standing buildings such as the Carmelite Church in Weißenburg, Bavaria or ruins like Mesa Verde in Colorado. When it can be applied, it does, indeed, do marvelous things and aid and abet modern archaeologists in ways unimaginable at the turn of the 20th century. But therein lies the rub: it can only be applied under very specific circumstances. A sizable piece of wood, preferably containing a ring sequence from the bark through to the heartwood is needed in order to analyze a date properly. Often, obtaining such a substantial dendrochronological sample can be destructive to the site and therefore taking such a sample may not be a realistic idea. When samples can be obtained, the type of wood then needs to be taken into consideration. Different types of wood are harder to date than others due to inconsistencies in their biological ring formation. For instance, the spruce in the area around Mesa Verde has provided archaeologists with in-depth dating sequences for the construction of the site by the Anasazi Indian tradition. But less than 300 miles to the southwest, establishing a date sequence for other Native American traditions like the Mogollon and Hohokam who used a variety of woods in their construction has proved difficult. And then, even if a suitable wood sample can be obtained, there must be an appropriate database of samples of the same or a similar type of wood from an equivalent environment to compare it against. In order to establish a date, hundreds of samples have to be considered, the number of rings on each counted and the sizes of their rings analyzed. These samples create a sequenced chronology which can then be traced back, which means that the older the sample you want to date, the larger the database required in order to create a sequence going back that far. Results, however, cannot be trusted at face value. If done properly, the date of the sample will be relatively correct, but this does not necessarily mean this is the date when a structure was built or a wooden artifact was in use. Dendrochronology reveals the date when the tree died, it may have died and been used years later as a construction material, it could have been cut down specifically for immediate use, or it even could have even been re-used from an earlier structure. Logic and reason must be applied to a given date before blindly accepted. When a reasonable chronology for a site is established, it is a marvelous thing, and science will have prevailed most magnificently and turned obscure questions and theories into bonafide answers. But while modern science has progressed considerably, it cannot tell us everything, even if sometimes pop culture pretends it can. And until a higher level of human creativity and science is attained, all we can do is preserve the past as best we can and hope that one day we’ll be able to fill in the blanks. Unfortunately, archaeological sites won’t last forever and the wood needed for dendrochronology is one of the earliest things to decay. The conservation of sites maintains their integrity so that future archaeologists can take advantage of techniques not yet developed to study a site as completely as possibly, even if the site is no longer in existence. Kuniholm, P.I. 1995. “Science in Review: Dendrochronology” AJA 99:199. Miles, D., 1997. “The interpretation, presentation, and use of Tree-Ring Dates.” Vernacular Architecture 28: 40-56. Pearson, S., 1997. “Tree-ring dating: a Review.” Vernacular Architecture 28:25-39. Thomas, D.H. 1999. Exploring Ancient Native America: An Archaeological Guide. London:Routledge. Webb, G.E., 1986. “Solar Physics and the Origins of Dendrochronology.” Isis. 77:2:291-301. 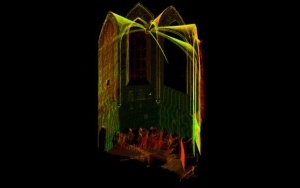 The <a href="http://archive.cyark.org/scan-shot-facing-east-into-the-high-choir-media">choir</a> of the Carmelite Church of Weißenburg which was dated using dendrochronology to establish the era of construction. 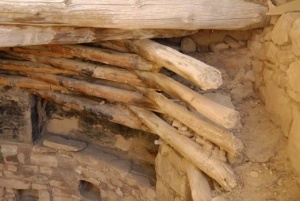 Kivas at Mesa Verde, like <a href="http://archive.cyark.org/top-of-kiva-g-media">Kiva G</a> pictured, were also dated dendrochronologically to establish the era of construction.